Since the tragic loss of Dale Earnhardt, much attention has given to the Head and Neck Restraint (HNR). Back around 1985, a racer named Jim Downing and his brother-in-law Dr. Hubbard created the first HANS (Head And Neck System). It was a big bulky thing, and Jim was seen running around in IMSA races using this contraption. Jim fiercely believed in this, and would never enter a race car without it. Years have passed and we witnessed many deaths caused by basal neck fractures, but it took the loss of Earnhardt, and soon after, Adam Petty - two of the biggest names in the sport - to wake people up. Prior to 2001, when we witnessed these losses, the HANS Device, as it was commonly known, was sold, but in very small numbers. The prices were high at the time, and sales volume very low. Then, all of a sudden, due to the above deaths, both sales and awareness increased immediately. Daimler Benz, at the time, was concerned about the safety of their drivers, and what a possible fatality would look like if one of their drivers were killed in a crash. They invested hundreds of thousands of dollars towards the research of the HANS - something the original founders could not afford to fund. In the following years, the European community and sanctioning bodies were quick to mandate the use of a HANS. The US market was slower to mandate its use, fearing resistance from racers, due to costs. One by one, the SCCA, NASA, vintage and other marque groups mandated the use of a SFI-approved HNR for use in their race groups only. During this time, other companies jumped into the game, producing their own version of a HNR. In order to use a HNR, you must have a proper 5- or 6-point seat belt system, since the HNR requires that shoulder belts hold it in place. All sanctioning bodies and clubs now require that race cars have competition belts, so this is not an issue. I believe that 95% of these groups require use of an SFI-approved HNR now, so we are going in the right direction regarding proper safety precautions. One other major safety concern has arisen in the past fifteen years or so: the growth of HPDE or track days, where customers take their street cars out on track for hot laps. For the most part, these cars come equipped with a 3-point harness, so a traditional HNR cannot be used. In some cases, these cars are faster than many race cars - it is amazing how incredible street cars have become during this time frame. So now what do you do? Many customers do not want to add competition belts to their street cars. On top of this, many instructors (who know the benefits of putting proper competition belts into their street cars), get into students' cars on a weekly basis. These cars do not have 5- or 6-point harnesses, nor do they have proper neck protection. About twenty years ago, a safety engineer addressed these needs. His name is Trevor Ashline, and he created a company called Safety Solutions. He has since sold his company to Simpson, which also owns HANS. Trevor developed an HNR system that was not secured by shoulder belts, but instead was strapped to the body and met SFI approval. At the time, his products were in direct competition with HANS, and both products were seen and worn weekly in the NASCAR paddocks. Trevor continues to be employed as a consultant to Simpson, and helps in developing many low-cost solutions to the head restraint problem. One solution that was widely used was the R3 (which is no longer in production). Many of the major car companies were concerned about their test drivers testing cars while only using a 3-point harness. Ford, for example, tested in-house what is now called the Hybrid, and found that it significantly reduced head movement and possible neck injury. They now require all of their test drivers to wear the Hybrid in conjunction with a helmet. The Hybrid is SFI-approved and strapped to the body. Many drivers and instructors use these with their 3-point harnesses. They strap up to posts on the helmet similar to the way other HNR devices do. However, I want to point out that there is no specific test by the SFI for an HNR with regard to a 3-point harness. This is a major concern due to the risks of driving a vehicle with only a 3-point harness at HPDE events. So... what do you do? I have been selling safety equipment since 1983. During this time, I attended hundreds of races, both here and in Europe. I visited safety equipment factories in Italy twenty-three times and I have seen a lot. What I would hope is that you learn from my experiences and those of others, and invest in the basics if you are attending HPDE-type events. You must wear a helmet... that goes without saying. But a HNR device is not required. You must make it a requirement! A simple accident at 38 MPH and above, or coming to a dead stop, will break your neck! I have seen sled tests at the Sabelt factory in Italy and you would not believe your eyes. To recap: the basics should be helmet, gloves, long-sleeve cotton shirt, pants, and a HNR device for cars with 3-point belts. I stated earlier that racers are generally required to wear an SFI-approved device, and HANS now start at $579.95, including posts. Other units are available for as low as $399.95 that are SFI-approved. HPDE drivers and instructors are not required to wear an HNR device, but I strongly suggest that they do. The only unit on the market that is widely used by auto manufacturer test drivers, and others, is the Hybrid, and the price point is around $1,100.00. This unit is SFI-approved, so it can be used in racing applications. There are many different versions of the Hybrid, but there is only one that was tested and used, so do not be confused when purchasing a unit. I am a salesperson and do sell these items, but this is not like buying a gallon of milk or a dozen eggs. This is an expensive and important decision when entering this sport, so if you have any questions at all, feel free to email or call me. This is not an exercise in scaring you, but providing you with the proper information and tools to enjoy a safe experience on track. We all have done this, and I can honestly say there is no better feeling than driving your vehicle on track at speed... just do it safely. 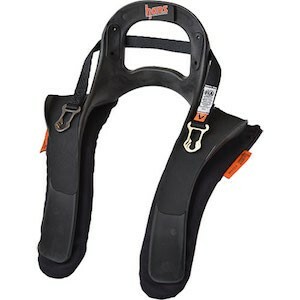 Click here to shop for head and neck restraints in the Winding Road Racing store.